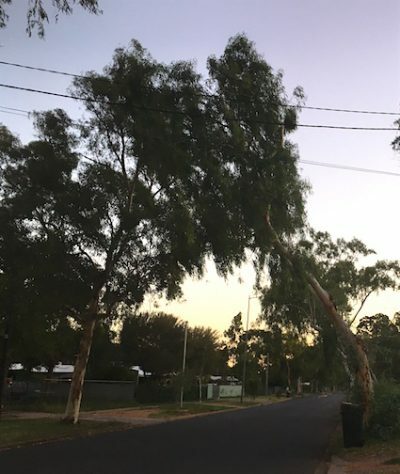 The Town Council will be asking the Power and Water Corporation to remove and replace the street trees made unsafe by their recent lopping, Acting Director of Technical Services Scott Allen told elected members last night. There are Australian Standards to follow, Mr Allen said. Councillor Steve Brown and Deputy Mayor Jamie de Brenni mentioned trees in Bloomfield Street in particular (see photo), some of them now leaning dangerously over the road, having lost their counter-balancing limbs. Cr de Brenni described the job as “butchering” and said the contractors should be “disgusted with themselves”. Cr Brendan Heenan said the contractors came up from south and didn’t care what the end result looked like, as long as no limbs were left within three metres of the power lines. Cr Melky was in the chair for the meeting of the Technical Services Committee and drew councillors’ attention to the recommendation before them that council “commits to develop and commence implementation of a Climate Action Strategy, which will also be integrated into Alice Springs Town Council Strategic Plan”. This came out of the Environment Advisory Committee, which he also chairs, and had been put forward by community member Robbie Henderson. A similar recommendation out of that committee previously met with resistance, but this one went through last night without discussion. In the advisory committee meeting Mayor Damien Ryan is reported to have said that climate action should be included in council’s Strategic Plan. However, Mr Henderson pushed for it to include baseline emissions, identified actions and implementation of “easy wins”. This appears to be what council will now work towards. In its Corporate and Community Services Committee council also voted to adopt its art and cultural policy and plan, titled Imagine Alice, more than a year in the making. The unanimous show of hands came after quite a long discussion around Cr Melky’s concern that not enough attention was being given in the document to Alice’s multi-cultural communities. While the word ‘multi-cultural’ may be missing from the document, cultural diversity gets plenty of mention, as well as visual representation. Indeed the visuals make this a very appealing document and underline the breadth of its understanding of cultural expression, with the inclusion of things like acrobatics, camel racing, community parades, discussions, as well as all kinds of (the more expected) performances and exhibitions. 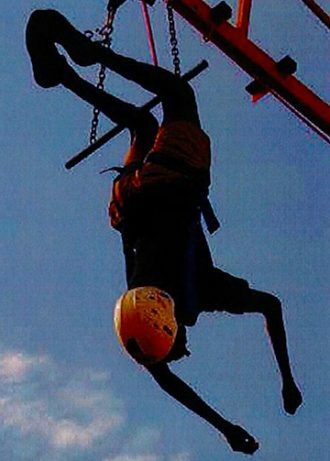 Left: Screen capture from the online draft policy document, showing ‘The Pinnacle of Terror’ at Youth Arts and Music (YAM) Festival 2015, detail of photograph by Sandra Brown. What difference having this policy and plan will make will depend on the resolve of council and its officers to push forward. It will also take time. For example, among the plan’s objectives is “cultivating a sense of place by activating public, non-traditional and open spaces”. Well, there you have one of this community’s major challenges.